Utility Locate & Subsurface Utility Engineering is carried out for planning/design purposes and more importantly prior to excavation works. Due to lack of information and unreliable/inaccurate data on utilities laid on the ground it is imperative that utility locates be conducted to aid planners and construction personnel in designing or carrying out excavation works. We are well aware of the inaccuracies of as built drawings or their incompleteness due to progressive infrastructure works being carried out. 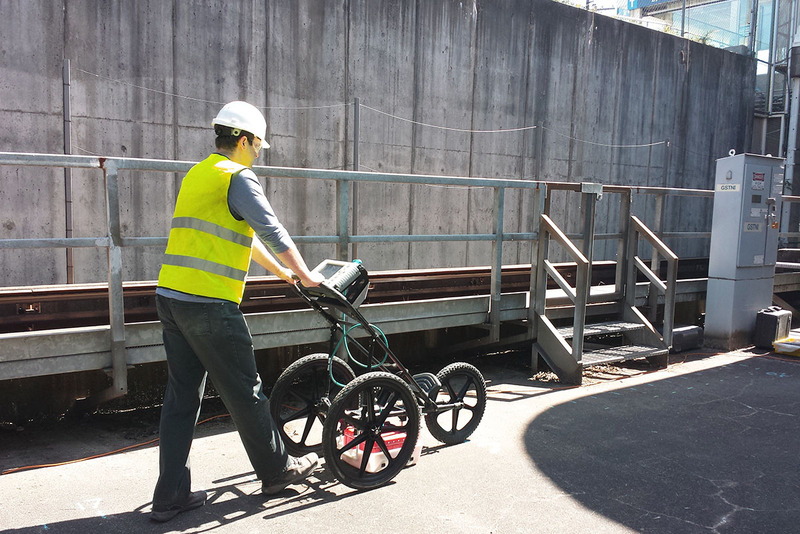 CSi uses GPR and EM technologies to carry UL surveys. GPR can detect both metallic and non metallic objects whereas the supplementary EM allows us to identify energized targets easily. There are essentially two main categories of utility locates. The first one is called Private Utility Locate (PUL) and the other one is subsurface utility engineering (SUE).CSi is able to provide both services to our Clients. Private utility locate as the term connotes is UL that is carried out within private properties or beyond the service meter of the utilities. The relevance of the PUL cannot be underestimated (compared to SUE) since the adverse consequences of hitting any of these utilities is no different from those with public domain. These utilities are actually extensions of the public mains which are laid in the more traffic congested roadways. Subsurface Utility Engineering (SUE) is a term that has recently been used and misinterpreted as UL work within right of way (ROW) or public areas.Actually SUE is the systematic identification of the quality of information needed in project planning. ASCE defines SUE as a branch of engineering practice that involves managing certain risks associated with utility mapping at appropriate quality levels, utility coordination, utility relocation design and coordination, utility condition assessment, communication of utility data to concerned parties, utility relocation cost estimates, implementation of utility accommodation policies, and utility design. It provides accurate mapping of existing underground utilities, eliminating the need to “find out the hard way” that plotted utility information was inaccurate. Performed during the project design process, Subsurface Utility Engineering can help utility owners, designers, engineers and contractors avoid costly conflicts or project delays. An example of a GPR profile showing the identified underground utilities. Identify utility owners that have facilities on, or may be affected by, the project. Contact these utility owners (…face-to-face meetings are preferable) and provide them with information about the proposed project. Schedule periodic follow-up meetings. When the highway plans are about 30% completed, or possibly even sooner in the planning phase, provide the plans to utility owners along with a request that they review the plans and provide pertinent as-built or other existing utility information. Obtain existing utility information from other sources. Review all information that can be obtained and plot it on a utility composite drawing or equivalent. This is Quality Level D (QL-D) information. Make field observations to identify visible above-ground utility features. Survey and plot resulting information. This is Quality Level C (QL-C) information. It is correlated with the records information (QL-D). When records and features information do not agree, resolve discrepancies. 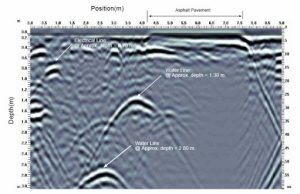 Use appropriate surface geophysical methods (i.e., pipe and cable locators, terrain conductivity methods, resistivity measurements, metal detectors, Ground Penetrating Radar, etc.) to designate existing subsurface utilities or to trace a particular utility system. This provides two-dimensional horizontal information. Place paint marks on the ground. Place identification flags or stakes on the paint marks or coding on the pavement at 50-foot intervals and survey to project control. Depict resulting information via computer-aided design and drafting (CADD) or manual plotting onto the client’s plan sheets, Geographic Information System (GIS) databases, or other appropriate documents. This is Quality Level B (QL-B) information. If requested by the project owner, also perform surveying and depict information about aerial utilities. Resolve differences between QL-B, QL-C, and QL-D information. This may involve additional surface geophysical searches and/or actual exposure of some subsurface utilities. This may require re-depicting utilities that have previously been depicted in order to present the more accurate information. Develop a conflict matrix showing all possible highway/utility conflicts. This involves comparing depicted utility information with proposed plans (highway, bridge, drainage, maintenance of traffic, and other). The resulting matrix contains columns to record the physical location of each conflict, the name of the utility involved, the nature of the conflict, the action needed. Upon analyzing the information recorded on the matrix, it will be obvious that some conflicts can be readily resolved, some conflicts are questionable and additional information is needed, and some conflicts cannot be resolved. Convene and facilitate a meeting with utility companies to discuss potential conflicts and other aspects of the project. Discuss possible strategies to avoid conflicts and identify locations where additional three-dimensional information is needed. Expose selected subsurface utilities to obtain three-dimensional information. 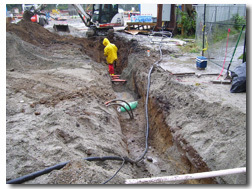 Use minimally intrusive excavation methods, such as vacuum excavation. Depict resulting information. This is Quality Level A (QL-A) information. Resolve differences between QL-A information and the previously obtained QL-B, QL-C, and QL-D information. Depict new and corrected information. Go back to the conflict matrix with the new QL-A information to determine the status of conflicts requiring additional information. Meet with utility companies to discuss these conflicts and possible strategies to avoid utility relocations.